The last 24 hours of the 7 day trip were some of the toughest times we had on the entire trip. 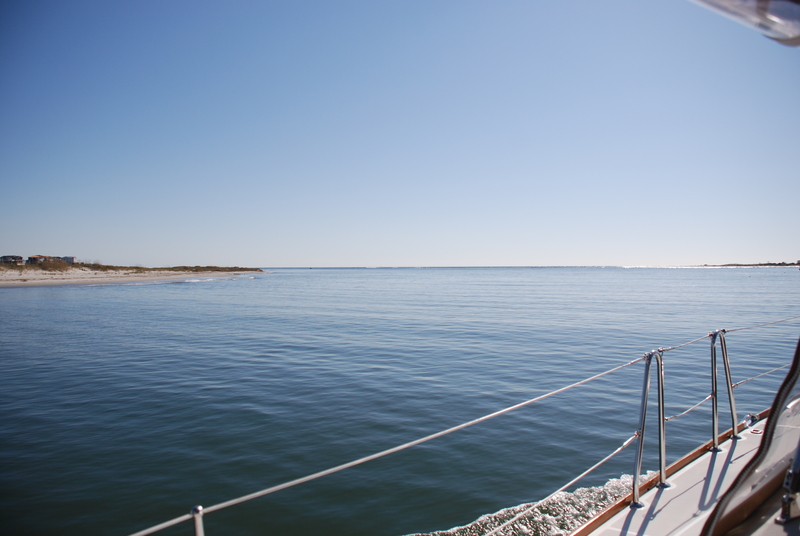 As we entered the ICW from the ocean there were no houses or traveling boats. 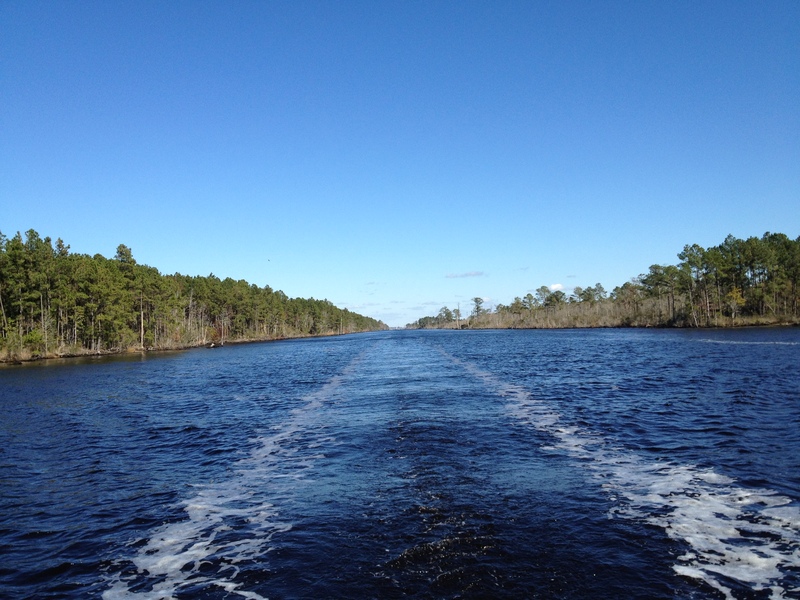 The ICW cuts through a large delta that is filled with swamps and streams. 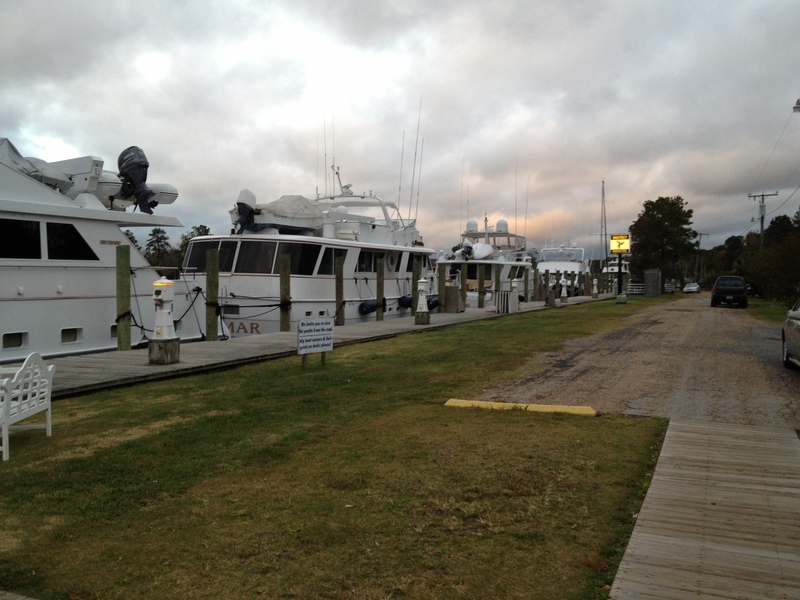 We traveled for 3 hours to get to an area where we had reservations at a small marina. When we arrived, a dock that could hold 2 small boats was full. There was an area on this small creek (Mc Clellanville) that contained a fish processing plant and a large commercial fishing fleet but no dock space available. With darkness falling, storms on the way in a few hours and a very strong tide current, we were forced to anchor in the ICW just off the entrance to the creek. As I set the normal alarms for depth, radar and anchor drift, I knew that with the coming wind and tide changes it was going to be a long night. I wasn’t sure with all the changes in direction the boat was going to make during the night weather the anchor would hold. 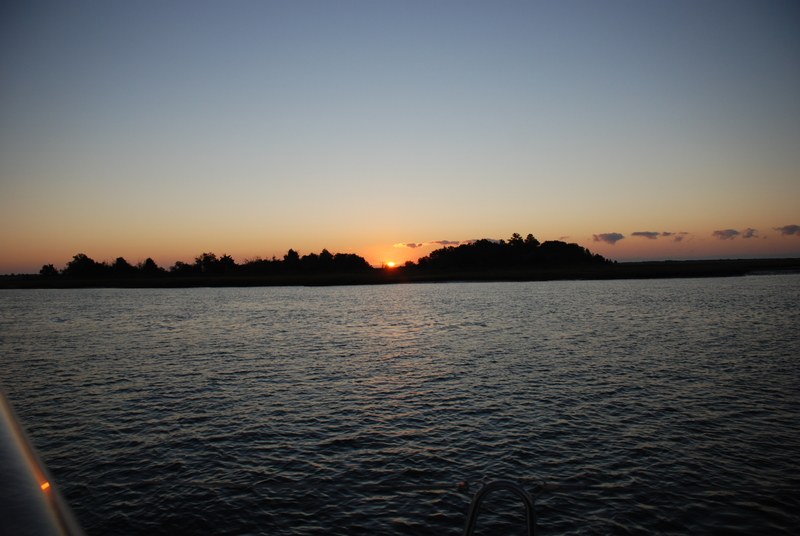 The first change in tidal current came about 11pm when the boat went from facing west to facing east. After resetting the alarms several times, I retired about 11:30. Deb had proceeded be to bed by several hours. About midnight the south winds from the approaching storms again turned the boat. The boat drifted a few dozen yards and the anchor caught. The wind speed continued to climb and I saw several times winds in excess of 30 mph. How well would the anchor hold in the mud of the narrow channel? Failure of the anchor to hold would run us hard aground in just a few seconds. At 3:15 the winds switched and were coming from the north now even stronger. Again the boat switched directions, all the alarms started going off. As the wind and rain howled, I woke Deb up and told her she was on watch till 6am. I needed some rest and she had slept several hours. As she woke me promptly at 6am, we had several commercial boats and a barge slip by us in the narrow channel. Still totally dark and the wind still building, I told her we had GPS and radar the same as the commercial boats, we were pulling anchor and getting underway. 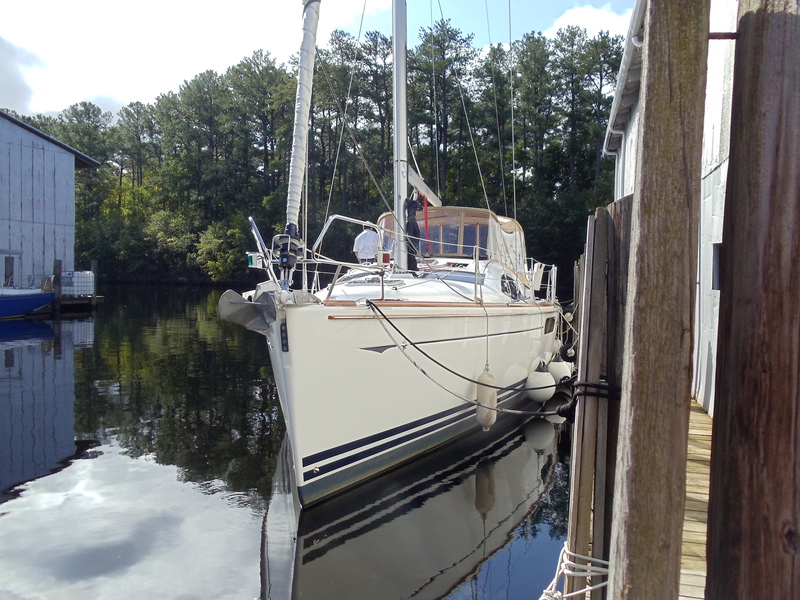 As Deb went up front and stated running the windless to pull in the anchor, the boat backed up and I felt the rudder stick into the mud on the side of the channel. 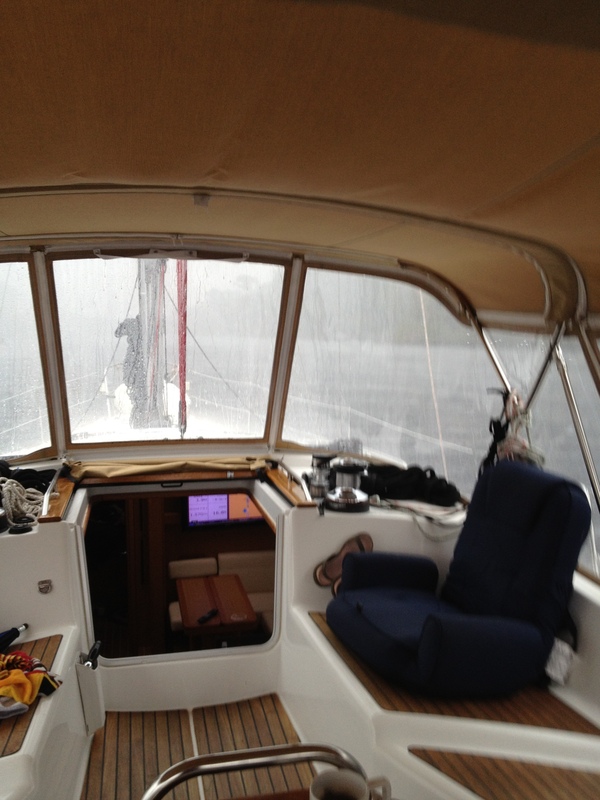 As she gave the all clear for the anchor, I eased the throttle forward and the rudder pulled from the mud bank. We were underway but I could see nothing and the GPS was not showing direction at first. After a few minutes easing forward at idle speed, I got my bearings and we were underway down the channel. I forgot to shut off all the alarms I had set so every alarm was sounding as we moved down the channel. In about an hour daylight was approaching and we knew the next 4 hours would be wind, mist and promise being the only sign of life we would see. The highlight of the trip was a pair of bald eagles setting on an embankment just a few yards from the boat. They were looking out over the swamp and never even turned around to acknowledge our existence. 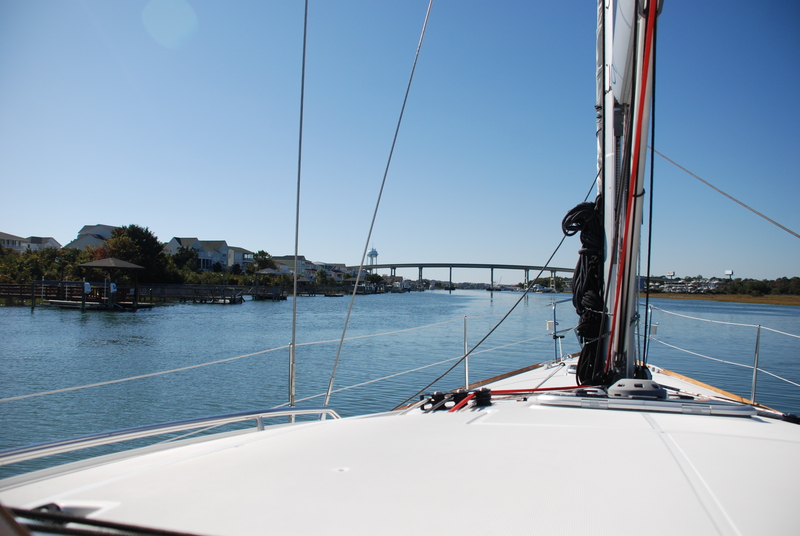 As we approached Charleston the wind had blown most of the water out of the channel. The water level had dropped over 4 feet and raw ground and beached boats were everywhere. I had two concerns, would the channel depths be deep enough the rest of the way to Charleston Bay and would the large swing bridge be operating with winds well over 30mph at times. The water in the channel stayed deep enough to pass and in the distance I could see the swing bridge had opened for another boat. With the winds blowing across the channel, the bridge must open when we get there. If we must stop to wait on the opening, the wind would quickly blow us aground on the narrow channel. The bridge operator had perfect timing and we passed without a problem. I expected Charleston Harbor to be rough 5 to 7 foot waves but as we entered the large harbor, the waves were only a few feet tall. We passed through the harbor and into our final marina for this trip. 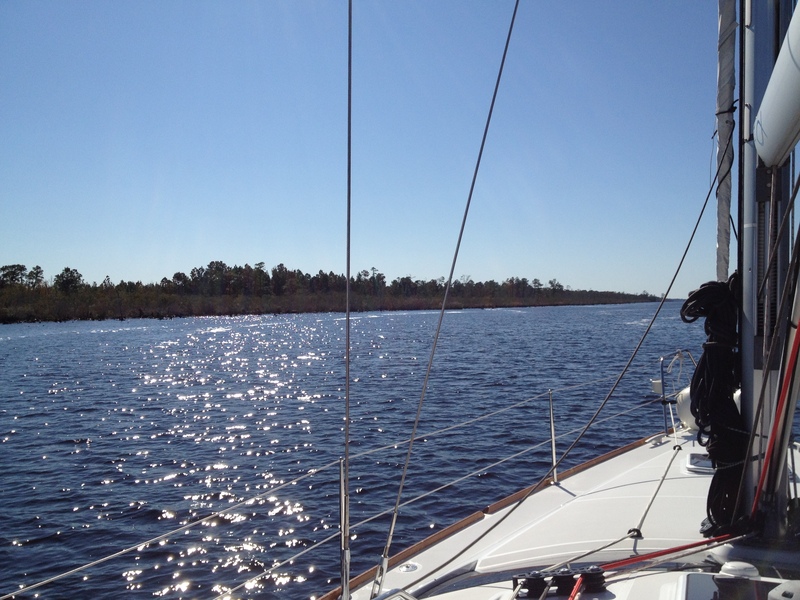 In closing: 450 miles from Norfolk to Charleston (100miles further than planned), seven days where the north wind blew every day except the day at sea. The weather was colder than normal but still warmer than home. I can’t help but think back to our travels so far. So many ports, sights, people and cities we had never seen before. So many unknown mornings of what would happen that day with the weather, seas or how far we would get that night. Will there be a port we can sneak in at the end of the day? Will the fuel filter stop the motor at the wrong time? Will the wind forecast be wrong again? Our faith always allowed us to put these many worries behind us and enjoy the journey. Needed advice from people passing by the boat always amazes me. Sometimes warning about places like Hell’s gate that saved us from real dangers or assurances about bridge heights or ocean inlets that are safe to pass. These messages came without fail and from people who had no clew they were delivering an important message required for our passage. The most amazing blessings of all come when you really put yourself out there. 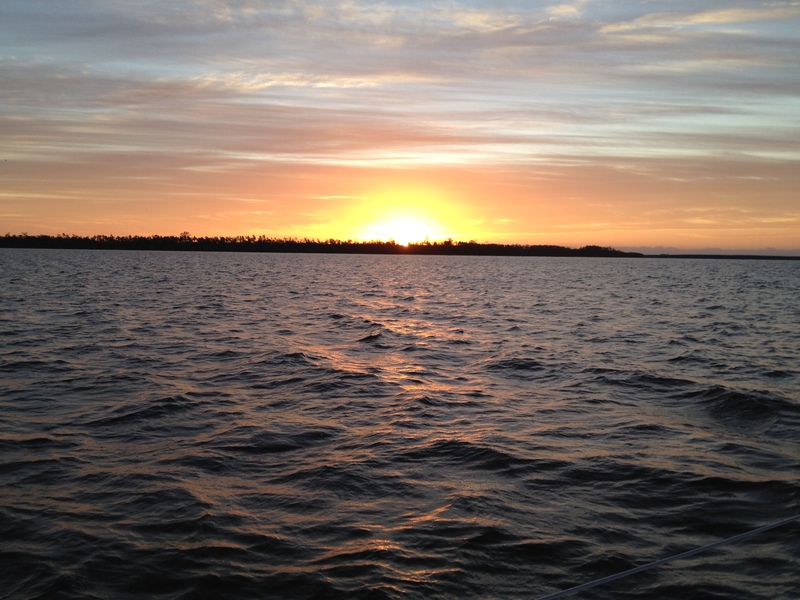 All the sunrises and sunsets, the trips through areas only seen by boaters. Traveling waters and to ports that this countries earliest explorers have traveled. The amazing power and size of the US military that has bases all along the east coast. 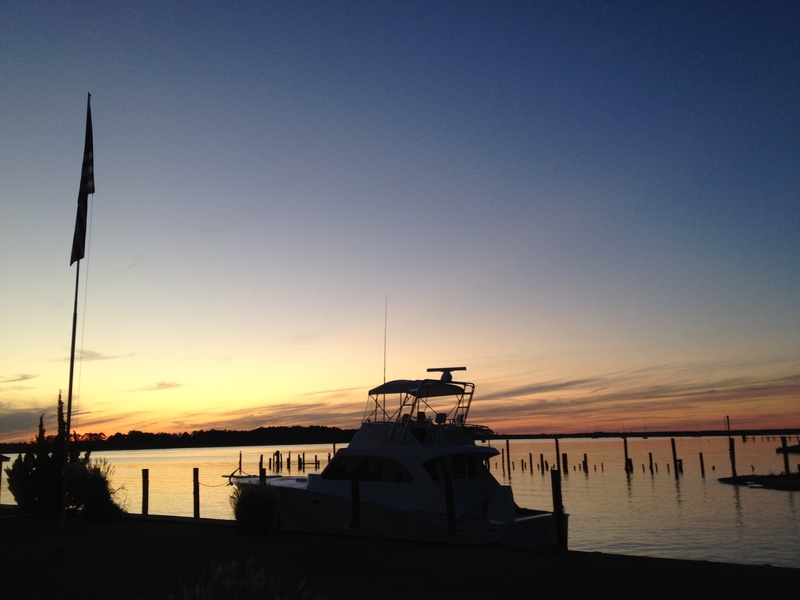 So many awesome boating areas, people and harbors, each with its own personality. I am pumped and ready to continue the journey! Thank you to those who follow this blog. Remember there are more pictures and post on our Facebook accounts as it is easier to quickly post. I hope we have given you a taste of the journey. We have arrived at the boat and went to the store to stock up on supplies before leaving first thing in the morning. We had stocked up on dry goods before we left a month ago. Everything on the boat seems fine. The marina is full with both power and sail boats all heading south. I am wondering if we will be able to find nightly dockage with so many boats all heading south. It is cold and rainly with tonights low expected to get down to mid 40’s. The high will rise to the 60’s tomorrow but I hear that a snow storm will be north and causing bad weather tomorrow. Of course we have geo-thermal heat on the boat as long as we are at dock and the engine heats the cabin when we are under way. I will post on our progress tomorrow. The North Carolina Coast and Outer Banks for the next several days, I’m so excited to get moving.